Complementing our extensive specialty product portfolio, RTP Company can color any resin you select to the exact color you request. Unparalleled experience that comes from routinely working with over 60 different polymers types in combination with 100s of performance additives — coupled with corresponding process quality control necessary to produce specialty materials — guarantees that your color will match your approved standard during every production run. Precolor products range from custom compounds to specific tradename resins from any resin manufacturer — whether you need a specific polymer or let RTP Company choose the resin based on your specifications, we maintain the same precise color tolerances. Delivered when you need it, precolored samples and production orders are shipped within 5 business days — always with the highest quality and commitment to service, and attention to detail only experience can provide. 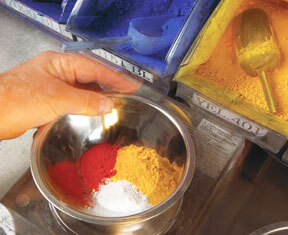 Request your copy of our Color Technologies brochure today! Learn more about attaining quality color and how RTP Company will make your next application a colorful success.